Our pastors are truly exceptional. They are the dynamic duo of ministry. Their tireless dedication and commitment to our ministry is beyond words. They are motivators, prayer warriors, compassionate a shinning examples of the character of God, with the fruit of the spirit exemplified in them always. A man and woman who preach with boldness to edify, exhort and reprove the kingdom of God. They have a zeal to win souls and set them free from Satan's snares. We love them dearly because of their caring nature and genuine love for God's people. Their undying passion of faithfulness to God stands foremost in their lives. The anointing on their lives blesses those around them. Pastor Eddie is the pastor of two ministries in the USA. Upon This Rock Family Ministries in Decatur, Georgia and Greater Newbirth Family Ministries in Cordelle, Georgia. They are parents to Vickie, Sharod and Taboris and two grandchildren. 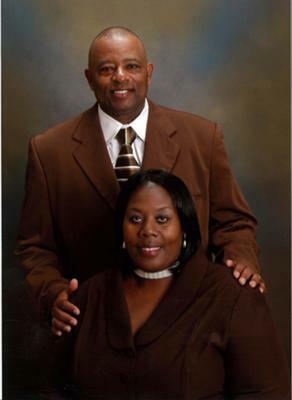 Upon This Rock Family Ministries where families matter is proud and blessed indeed to have you both as our pastors and say happy 9th pastoral anniversary on Sunday June 29th, 2008. We love you both and purpose God's richest blessings for your lives. It was great to visit your church again. What a beautiful service. God is blessing. I am so proud of both of you. Looking forward to hearing a word from Lady Griggs at our prayer breakfast. Pastor Eddie and Pastor Deborah, words cannot express our feelings for the two of you. We love you and we pray God continue to bestow blessings upon your life. We thank God for allowing our paths to cross two God fearing individuals. Remember, you can do all things through Christ which strengtheneth you. Again congratulations and keep the Faith. Two People that truly love God! Thank you for everything. One thing I can say is that I know you guys walk the walk that you talk and thats a good thing to know cause that's the type of covering that I want. So keep building God's kingdom and just know the best is yet to come...Love y'all dearly! To the most two wonderful person in my life who helps me to grow in God. I want to thank you for the encouraging word and prayer - it helps me a lot. The two angels God has richly given us - congratulations on the best nine years and many more to come. Youâ€™re best is yet to come. Keep preaching the word, encouraging us, and praying for us. Once more, congratulations and thank you for being my shepherd, my pastor, and leader. From day one of arriving at the church on Pendly Hills, i felt such an enormous amount of love and realness from you two. I've been under your watchful care for about 2+ years and since then I've been through a lot. But because of your caring hearts, your prayers and the encouragement you give it hasn't been hard at all. My desire for for you is that God blesses you above and beyond what you could ever think or imagine. I thank you for being great spiritual parents that not only talk the talk but walk the walk. I can assure you that I'm here for you guys no matter what - you can count on me. If I were able to I would love to just shower you with all the fine things of life but for now until I reach that point I'll give what little I have with much dedication to the ministry. Just wanna say I love you and I will get numerous occasions to bless you how I desire. May God continue to bless and enrich and elevate you and your family.